The Chipper Clipper: Another Huge Haul! 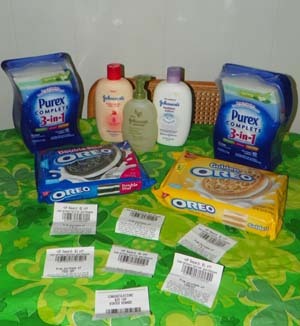 Staples, Rite Aid & Stop & Shop! Another Huge Haul! 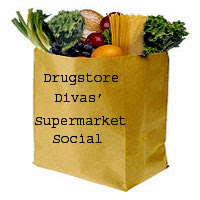 Staples, Rite Aid & Stop & Shop! Then I sweetened the deal with the $4/$20 Make Up Video Value and another $1 off and no prescription purchase Video Value. I paid for all the remainder with +Ups except for $.96. And I received $28 in +Ups! Not to shabby! This photo was from today at Staples... I got all this for $11.51. The ink was buy 1 get 1 40% off @ $29.99 and the scissors where $1 each regularly $7.49 and the Dry Erase Eraser was on sale for $2.00 this was for my son! 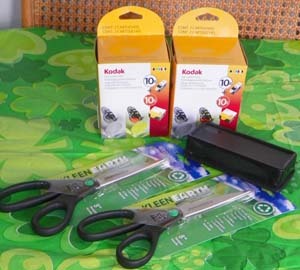 I had $33.80 in Staples Rewards and a $10 off $50 purchase from The Recycle Bank which you can get here! And finally also from I thought I was making out with FREE water... but I forgot about the darn CT bottle deposit...On sale at Stop & Shop for $1.00 with $1/1 Facebook coupons & 2 Green bags (- $.10) I got all this water for $2.55.